Installed a water treatment system at the L'Esperance Orphanage. The children use a BYOW (Bring Your Own Water) system to get clean water using gravity-fed sand filters and solar-powered ultraviolet light disinfection. 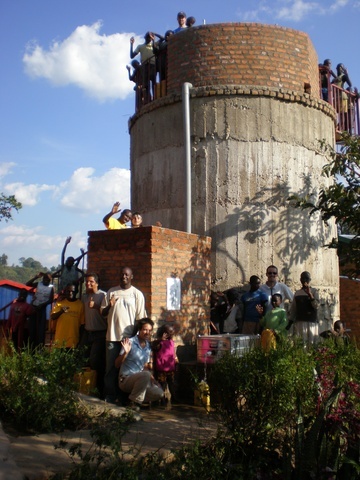 With support from Engineers Without Borders, Manna Energy Limited built a water treatment system that provides safe drinking water for 130 AIDS and genocide orphans at the L'Esperance Orphanage. The system uses locally available materials to create a water treatment system powered by sunlight and gravity. Water passes through a gravity-fed gravel filter, a gravity-fed sand filter, and then around an ultraviolet light that kills any remaining pathogens. In Rwanda, where diarrheal diseases are a leading cause of death for children under age five, this project is a major improvement to the quality of life and allows the children to spend more time attending school.